Deportivo 2-4 FC Barcelona: Liga champions! Liga champions for the twentieth-fifth time! Double winners for the eighth time! Needing just one point from the last five games, the title was as good as sewn up already, but it’s always better get things done sooner than later and that’s just what Barça did in the far northwest of the peninsula on Saturday night. And although the three points were not secured until late in the second half, it was a stylish finale with Leo Messi banging in a hat-trick to spark celebrations among supporters worldwide. After just seven minutes under the lashing Galician rain, Barça were already on fine course to accomplish the evening’s mission. Guided by the two newest additions, the assist from Ousmane Dembélé and the goal from Philippe Coutinho, the ball confidently found its way into the home net. Former Arsenal striker Lucas Perez promptly struck back at the other end, but much to the infuriation of the Riazor crowd, the flag went up for offside. What followed was a lively half, with chances at both ends before Barça doubled their lead with another fabulous piece of footy. Luis Suárez flipped a high ball to the far post and Leo Messi’s volley home was sheer class. That made him the first man to score 30+ goals in seven different Liga seasons. The floodgates were threatening to open, but Depor needed to win this game to have any chance at all of avoiding relegation. And they weren’t going down without a fight. And that fight was rewarded when Lucas Perez converted again – this time with no interruption from the linesman. Indeed, Depor most certainly hadn’t thrown in the towel. Eight minutes into the second half and they were back on level terms. And a well-worked move it was too, with an unmarked Emre Çolak finishing it off. Barça’s hopes of completing the first unbeaten Liga season in over eight decades was suddenly under threat - Depor were hungry for more. Messi again ... and again! The blaugrana managed to regroup after those moments of uncertainty. And the doubts were soon laid to rest when Messi scored not once but twice – two fine finishes on the back of delightful pieces of team football – and from there it was full steam ahead to the title celebrations. Ernesto Valverde sent on Andrés Iniesta for the final minutes, and home supporters responded with a standing ovation for the departing Barça captain. The game ended with contrasting emotions. Riazor was in tears. That result condemns them to second division next season, along with Las Palmas and Málaga. But it was a different story for FCB. For the seventh time in ten years, we’ve won the Liga trophy! Admirably and out of respect for the distraught home fans, the Barça players were restrained with their on-pitch celebrations. 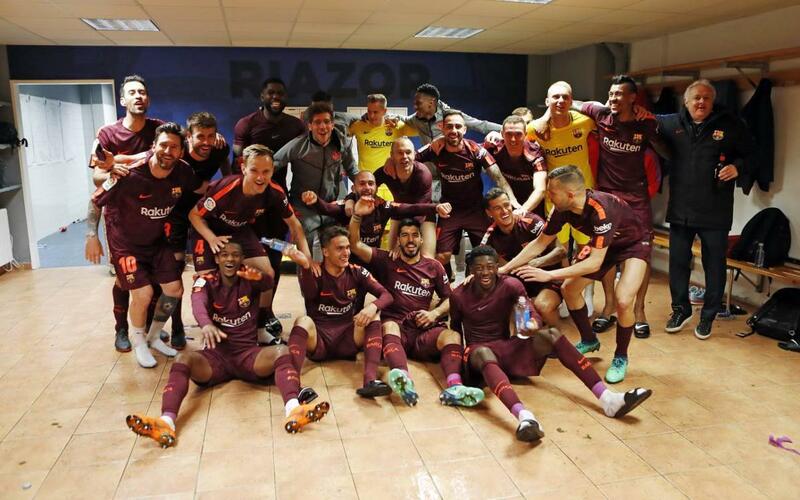 But once in the dressing room, there were jubilant scenes that are being emulated all over Catalonia – and in many other parts of the world to be sure! A lot of people won’t be getting too much sleep tonight! And for a very, very good reason. Wherever you are in the world – enjoy the party!